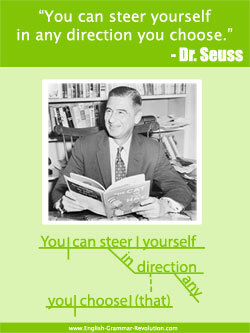 There are many places to find celebrity quotes, but where else can you see them diagrammed? I started this page thinking that I would diagram quotes from celebrities in our current culture. That turned out to be quite difficult. I like to diagram inspiring, well-crafted sentences, and hunting those down in today's media jungle was not a fruitful use of my time and energy. So, this page has turned more into a collection of inspiring quotes from past "celebrities." I hope you enjoy it! All of their quotes will be in sentence diagrams. Cool, huh? Opportunity is missed by most people because it is dressed in overalls and it looks like work. Victory is the sweetest when you have known defeat. If you can't explain it, you simply don't understand it well enough. If you think you can do a thing or you can't do a thing, you are right. He who opens a school door closes a prison. Idleness is the heaviest of all oppressions. An aim in life is the only fortune worth having. Books are good enough, but they are a poor substitute for life. A cheerful life is what the Muses love. A soaring spirit is their prime delight. 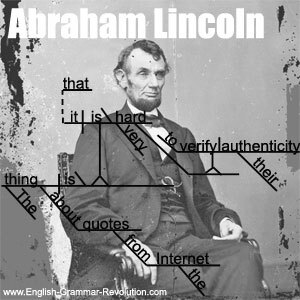 I found these celebrity quotes on the Internet, so keep the following Abraham Lincoln quote in mind as you enjoy these quotes and sentence diagrams. is that it is hard to verify their authenticity. My students love diagramming and are learning so much. Thank you for your inspiration and instruction. 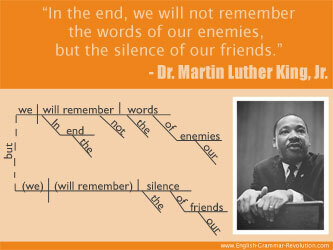 Sentence diagramming is an amazing tool for learning and teaching grammar. I don't know about you, but I went through my whole K-12 schooling being very confused about grammar. I just couldn't "get it," and I started to think that there was something wrong with me. Finally, in college, one of my professors taught me grammar from the very beginning, and she used sentence diagrams to do it. It was like one of those miracle moments in life because I finally "got" grammar, and I finally felt good about myself again. I had developed quite a complex about my "inability" to learn grammar, and I realized that it was not my fault. I had just never been properly taught. Anyway, ever since that college class, I had wondered why in the world sentence diagramming is not typically taught in classrooms anymore. After being out in the field teaching for a few years, I discovered that my students also responded well to sentence diagramming. That was enough inspiration for me. I started this website to spread the word, and I'm pleased to say that grammar and sentence diagramming are not dead! Since starting this website, I have heard from hundreds of teachers and students using sentence diagramming and singing its praises. Done with these Celebrity Quotes?